An extensive menu designed by our international Chef featuring local and western favouites which is both healthy and delicous. Three buffet style ‘all you can eat’ meals daily to supply and recharge your energy, suplimented by a 24 hour snack bar with cakes, chocolates and biscuits . The bar is always open with ice cold Bintangs, Heinekens, San Miguels and soft drinks to celebrate that memorable surf session. We also encourage surfers to bring their own duty free, we have ice and mixers available. Spacious bungalows cleaned daily, with king sized beds, cooled by the natural sea breeze and the shade of the coconut jungle. Fully designed and built BY surfers FOR surfers. Designed in a way that all of the beds have views of our three barreling waves. 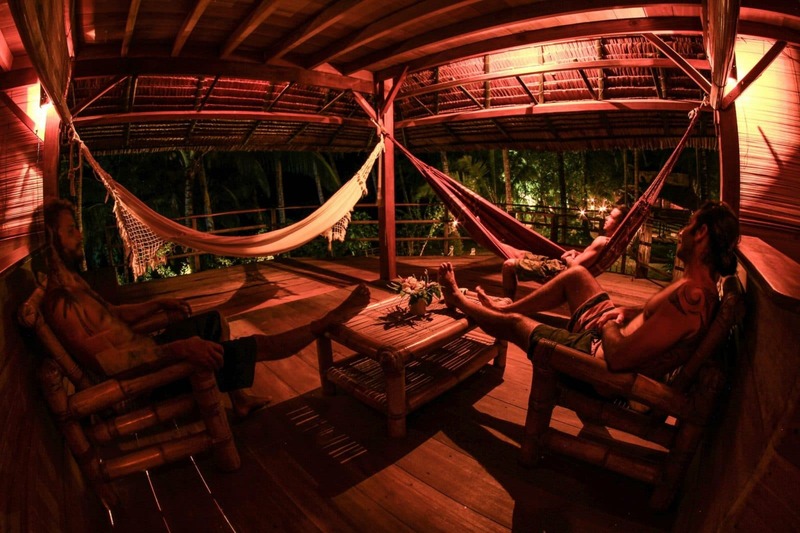 Each bungalow is fitted with hammocks, perfect for between surf relaxation. 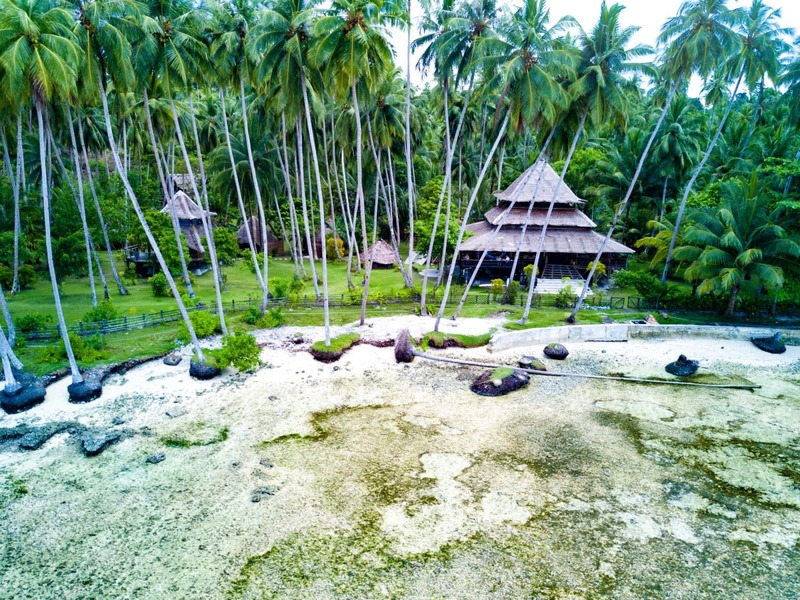 Surfing Village consists of four bungalows, each with three king sized beds, cooled by the natural sea breeze and the shade of the coconut jungle. Fully designed and built BY surfers FOR surfers. Designed in a way that all of the beds have views of our three barreling waves. 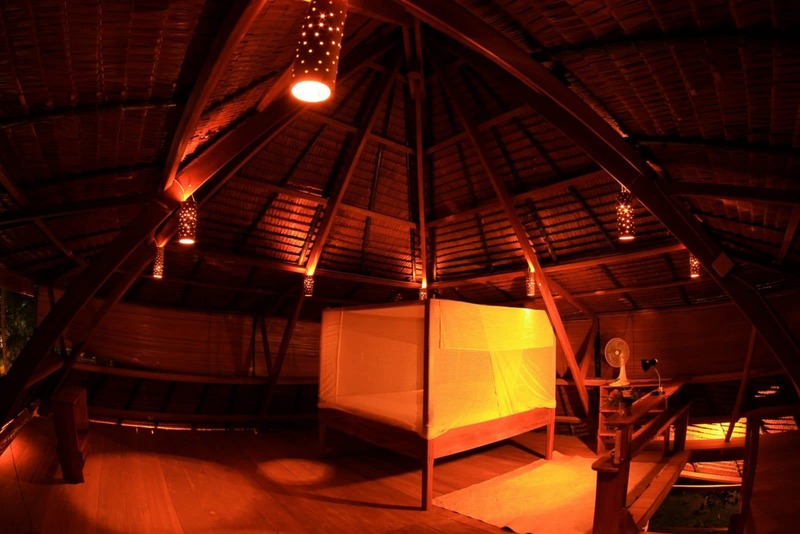 Each bungalow is fitted with hammocks, perfect for between surf relaxation. Built with local wood and materials, the bungalows are two floors high. The basement floor is the board room. The first floor has two private bedrooms with king size beds, plus a sheltered hang out area and a outside deck. The second floor is an open loft with a 360º view, housing a king size bed. Each bed is protected with a mosquito net and has its own fan. 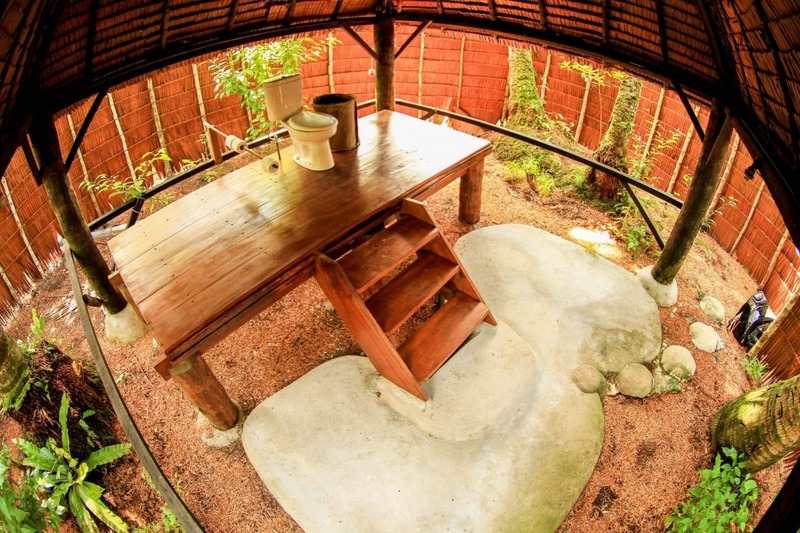 All bungalows have a private western style toilet and hot water shower. The Surfing Village main building is where our guests spend most of their “dry” time hanging out. It is our heart and is where we enjoy our meals, check the conditions and decide on where we’ll surf next. In the afternoons it’s where we drink ice cold Bintangs after surfing, share stories and laugh about the day’s waves. After dinner this is where we have signature slide shows, screening the photos of the day from our professional photographers, always good for a laugh between mates. At the back of the restaurant we have our “Complexo Complicado Poli Esportivo do Norte Sumatra”, with 3 x 6 ft billiard table, where we hold our very competitive pool championships, ping pong table, darts, chess. There are also a few different common areas for socialization, reading, playing games or just relaxing, including one of the most used and sought after areas in the SV – the hammock area, equipped with our wireless audio system. 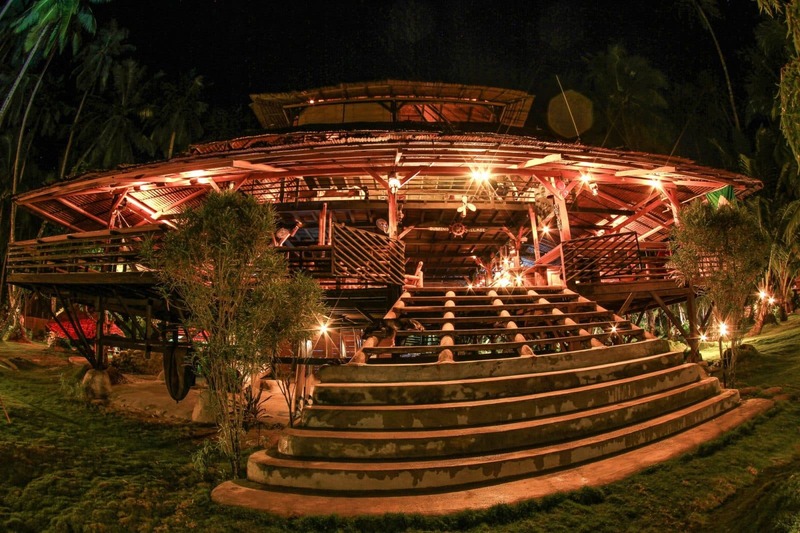 The 3º floor, 10 x 10 meter open space, With a spectacular 360 degree view of the SV and the waves surrounding us, perfect for your yoga, stretching, relaxing, etc…. 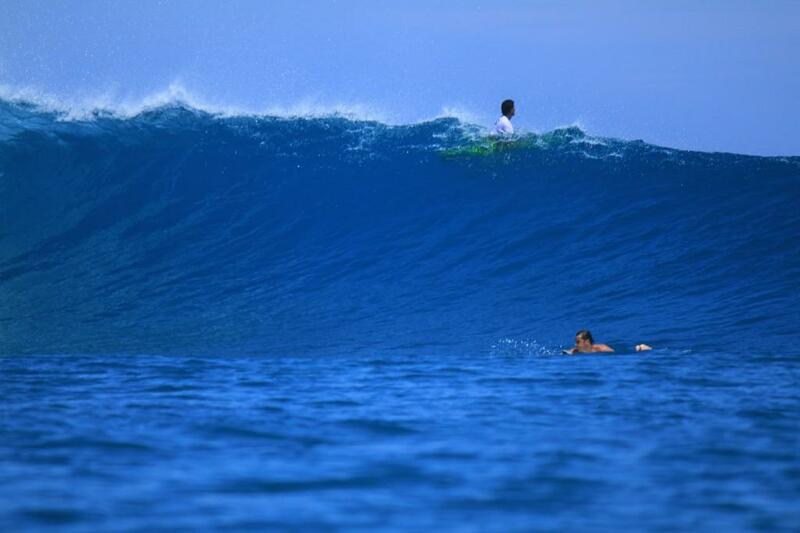 keeping one eye on the pumping sets of Pasti and Naga’s. An extensive menu designed by our international Chef featuring local and western favouites which is both healthy and delicous. Three buffet style ‘all you can eat’ meals daily to supply and recharge your energy, suplimented by a 24 hour snack bar with cakes, chocolates, biscuits and more. Vegetarian options are available in every meal and all other dietary requirments can be catered for. The bar is always open with ice cold Bintangs, Heinekens, San Miguels and soft drinks to celebrate that memorable surf session. We also encourage surfers to bring their own duty free, we have ice and mixers available. Having as your hosts & surf guides the longest residing surfers in the region definitely has a few benefits. When we first arrived in 2005, we had no idea what really awaited us. Over the last 12 years we’ve searched and searched, finding waves so amazing that it’s hard to explain. 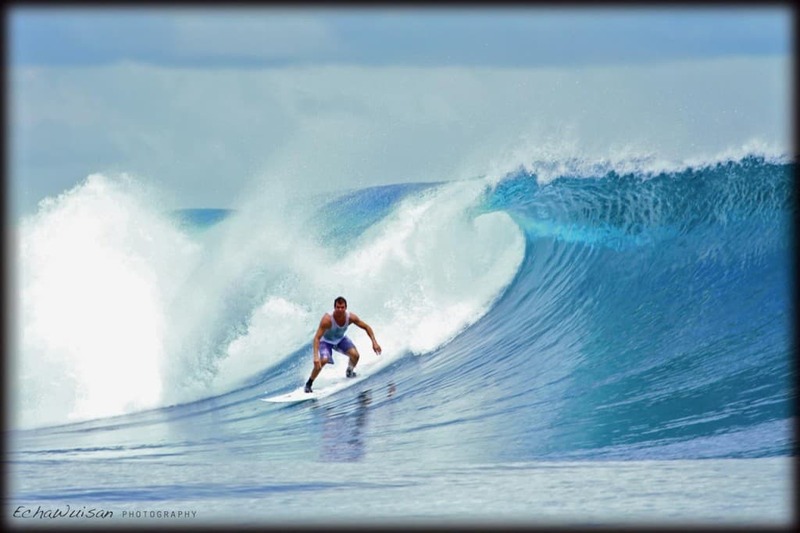 We surfed many different reefs, rocks and beaches, on many different tides, swell angles, winds etc…. Some were epic, some weren’t. But all these years of experimenting gave us a knowledge of the area and it’s intricacies that only time and experience can bring. 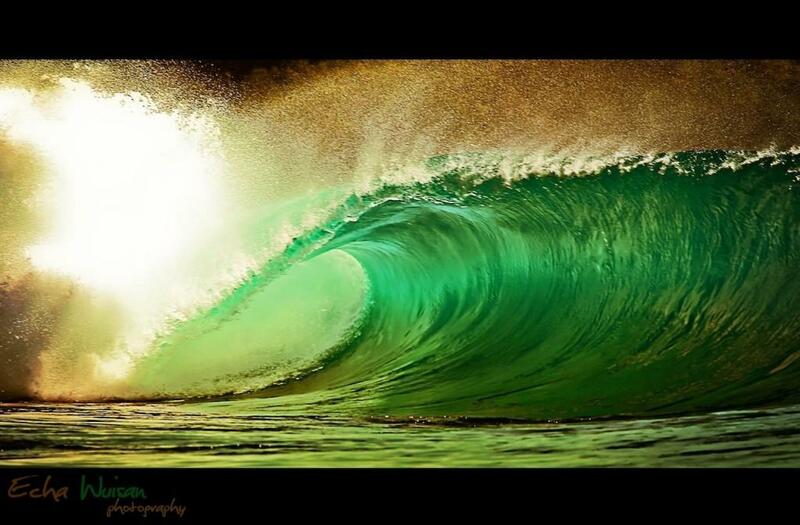 Culminating in the incredible total of 18+ completely different, world class waves. 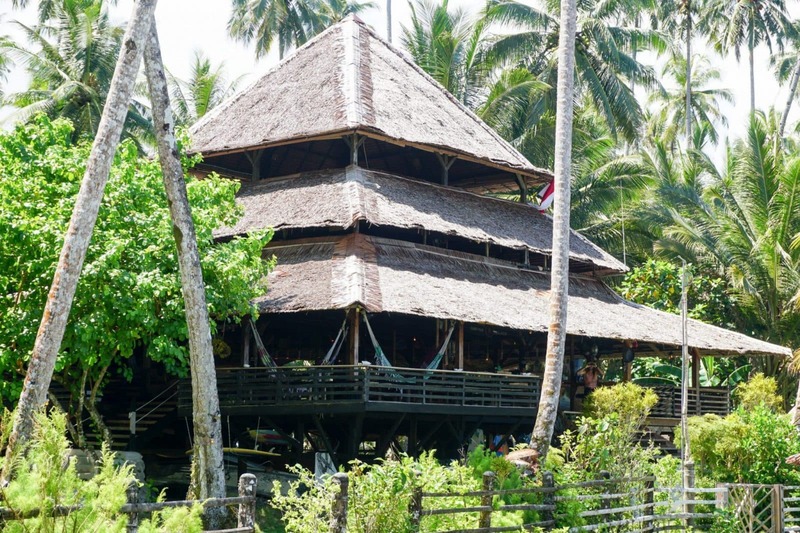 3 of them are located right on the doorstep of the Surfing Village, Pasti, Lobang and Nagadens. The other 12 waves are less than a 20 minute boat trip away. Only Jauh, Facas and Shhh are a little more than an hour away. And it doesn’t stop there! If possible the whole quiver…..or only your best boards!!! 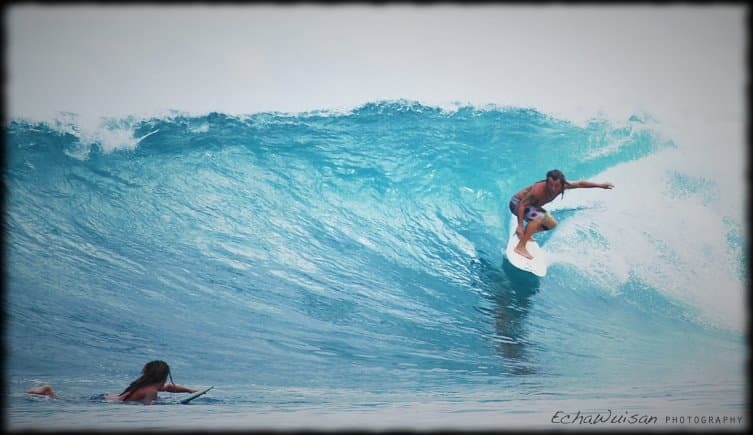 Keep in mind that the waves in Indonesia have a long period and break over shallow coral reefs, this makes them much faster, requiring a board with more paddle rather than a board for a beach break. 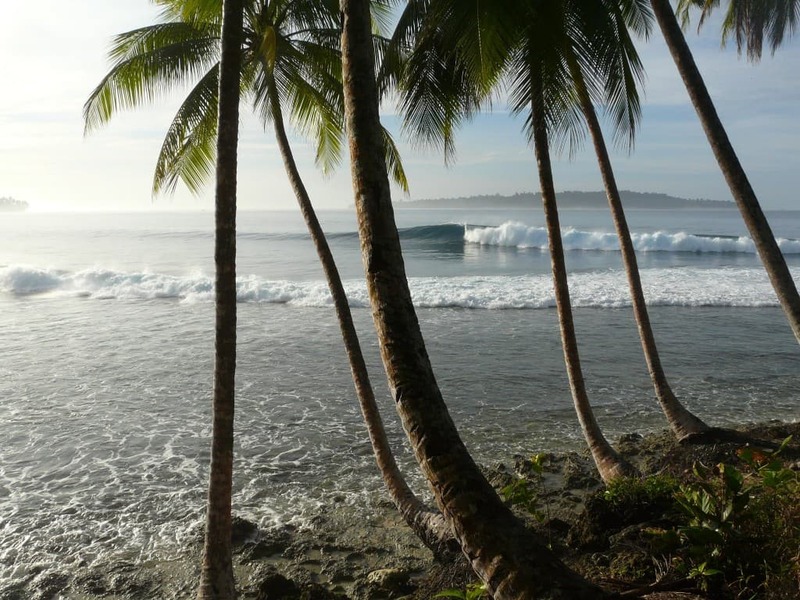 There are a number of reefs with a lot of potential that we haven’t even had time to explore….Maybe you will be the next to surf and name a virgin wave this year! Fast and powerful right hander, 3 tube sections, with its ripabble days. Barreling right hander. Short and thick. Indicates when Pasti will pump. Big, heavy and suicidal right hander. Sinister left hander. FSH. Fast, Shallow and Hollow. Located on the opposite tip of Plankton Bay. Island in front of the Surfing Village. Ripabble left hander, long and powerful, with barreling sections. Holds waves as big as the ocean throws. Long barreling left. On the right tide it is one connecting barrel all the way down the line. A mix of desert Point and G-Land. Long and shreddable right hander that works on any swell. Located behind Baga’s island. Right and left barreling A-frame with Hawaiian weight and style. Hair Raising Left. Fast and hollow. The area’s Teahupoo. 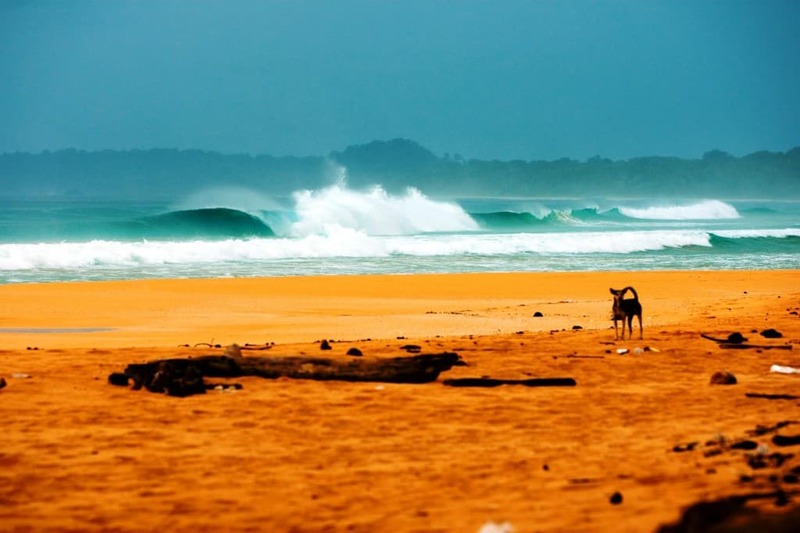 Fantastically fun left with amazing back door barrels. Peak wave opening long and easy walls to both sides inside a protected bay. Ideal spot to learn to surf. Right and Left breaking in the middle of the neighboring bay, in front of a small rock island. 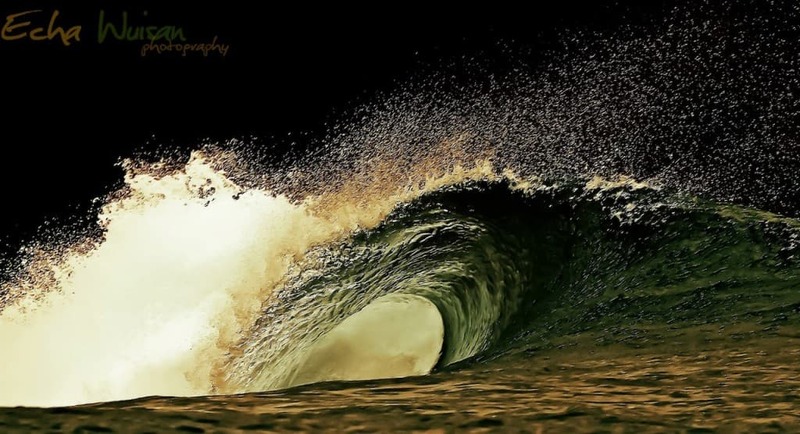 Big and powerful right hander, the first of 3 rights on the coast of Tantras. Fast, shallow and hollow right hander, less consistent, but the most challenging. Right hander with the first section barreling, then opening up to a ripabble wall with another barreling section toward the end. Long and ripabble left hander, with good barrel sections, set in a paradise bay, fast and hollow. Very shallow, fast and hollow left, with amazing barrels. Only for the experienced surfer. Very heavy right hander that only works on big swells. 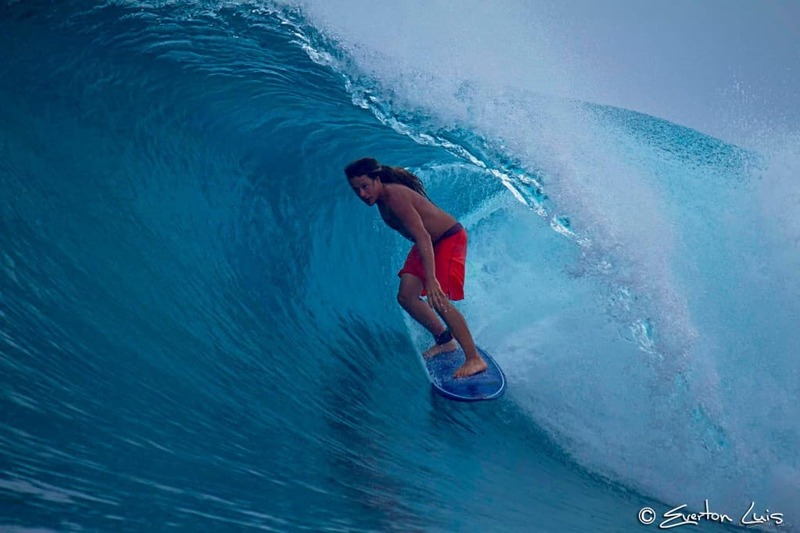 In Indonesia the peak swell season is from April to October. 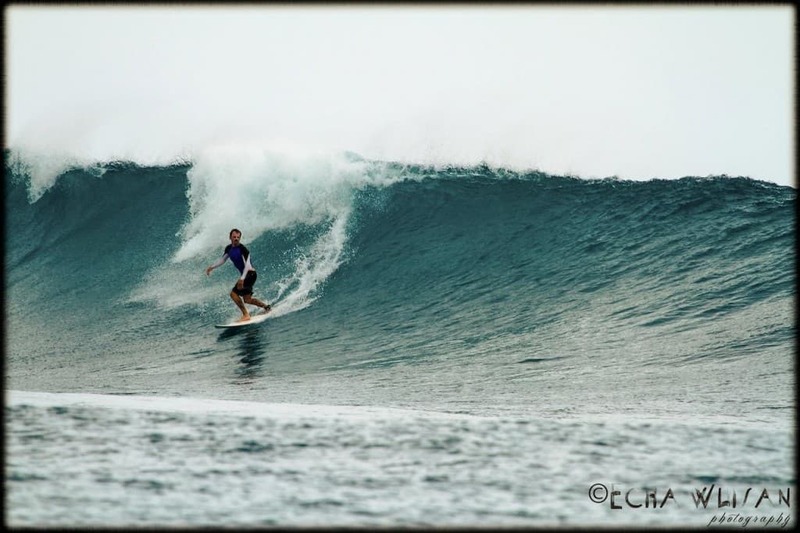 According to a research published in the American magazine ‘Surfer’, the probability of surfing perfect conditions, during a 10 day period in peak season is 85% in Indonesia, while in Hawaii it’s approximately 70% and Australia, little more than 60%. 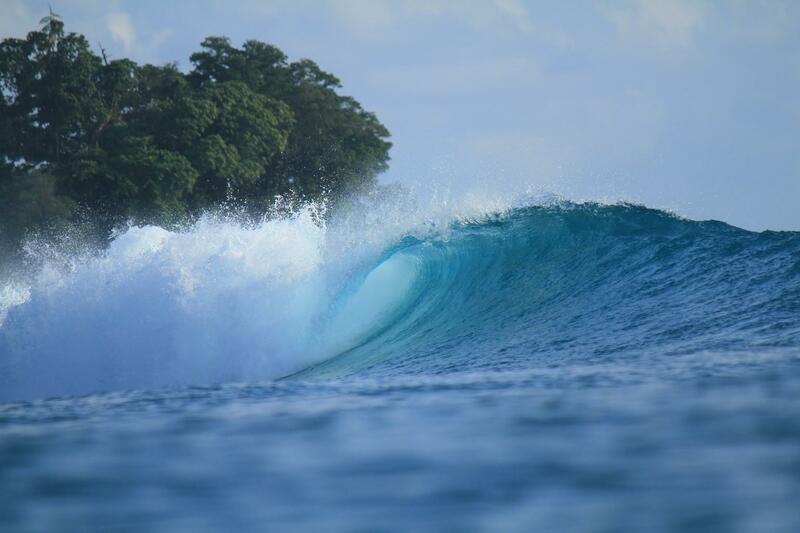 Our departure from Surfing Village is from Padang, Sumatra. The airport in Padang is called Minangkabau International (PDG) and there are direct flights from Jakarta *Indonesia and Kuala Lumpur, *Malaysia. The estimated time of departure from Padang is 18:00 (depends of tide time). This allows guests sufficient time to arrive as we prepare for the overnight crossing, arriving at the Surfing Village just in time for some breakfast barrels. Our boat has an air-conditioned main cabin with 12 beds, toilets, a lounge and an open air area at the rear for those guests wanting to enjoy all the splendor of a Sumatran night at sea, downing a cold beer and getting psychologically prepared for their arrival in Paradise! Central safe looker, to keep all your money, credit cards, and documents well protected. Board games: Chess, Backgammon, Cards. You really made me feel at home. This was my first time to a land camp in Indonesia and it was the best time I’ve ever had in Indo. To get into Indonesia your passport has to be at least 6 months from expiry date. It is also necessary to have a ticket out of the country. 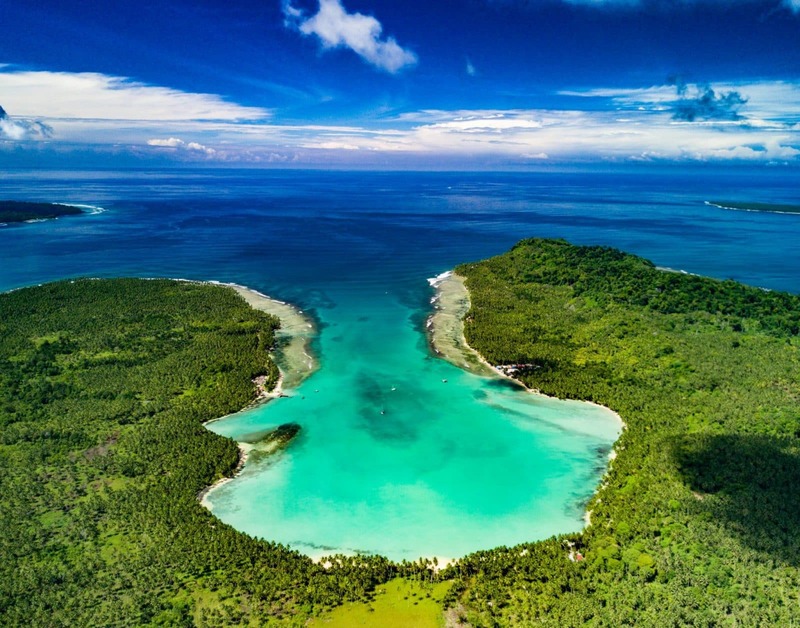 Indonesian visas for 30 days (including arrival and departure day) are free and given on the International arrivals in the Bali, Jakarta or Padang airports. For visas longer than 30 days, get in touch with the local Indonesian Embassy at least one month before. The Surfing Village strongly advises all guests to have international health insurance in case of serious accidents. For the small and medium cases the Surfing Village has a small and basic hospital for all first aid, located less than 15 minutes from us. The hospital even has medicine for the treatment of Malaria. Changing money in Padang can be a real mission. In Indonesia big notes (US$100) have more value than small ones (50, 20,10,5). Another important detail is that old notes are NOT accepted. From 2000, inclusive or older. Also NOT accepted are notes with the series number starting with serial numbers A, B, C, D, E, F or with any folding/pen marks. They have to be crispy new to avoid headaches. To keep in touch with your family and make your friends really jealous from your last perfect surf session, we have local mobile phone signal. You need to have International Roaming or you can get your Indonesian simcard in Padang. The Surfing Village has 02 or 03 surf guides/photographer who will be available to all guest surfers on demand. Guests can take home all the photos from the whole trip. 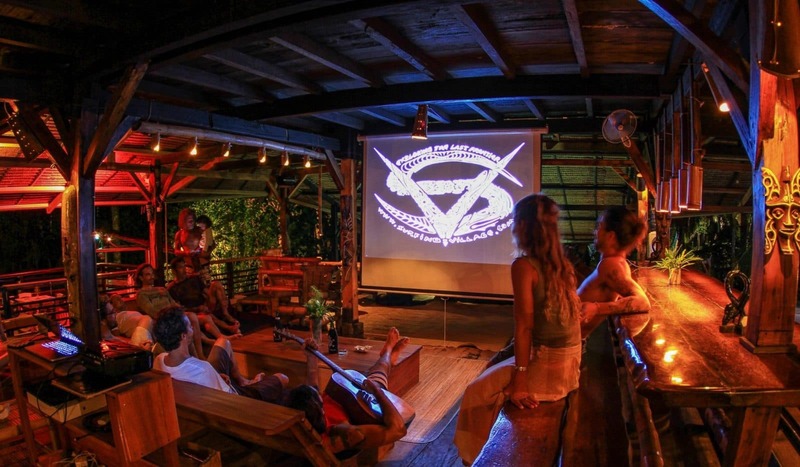 From the arrival, visuals, all the crew chilling out and especially your best surf sessions in one package. A slide show session is held in our Screen, located on restaurant, with the pictures of the day. Accommodation on King Size bed in stylish bungalows, all with stunning jungle and ocean view, each bungalow has their own set of hot/cold shower, sink and western flushing toilet. Daily boat access to the best surf available depending on swell, tide and winds. Our trusted partners can help you choose and book all your local and international flights, travel logistics from wherever you are, your Medical Insurance and book your Surfing Village stay. All you have to worry about is getting the boards packed!